The Global Standard is a reference standard that civil society organisations (CSOs) can adopt and implement to strengthen their accountability practices. Using 12 accountability commitments, it tries to capture a shared understanding of accountability from CSOs from all over the world and it embodies a dynamic approach to accountability by encouraging organisations to engage in a continuous two-way dialogue with stakeholders. The Global Standard focuses on putting people at the centre of CSOs’ decision-making process. This is a starting point that will help the civil society sector become highly resilient, participative and responsive, generating trust on the ground and leveraging stakeholder contributions for greater impact. This is crucial to preserve and strengthen civic space and to build a just and sustainable world. The 12 Commitments of the Global Standard summarise the critical areas of good CSO accountability practices. 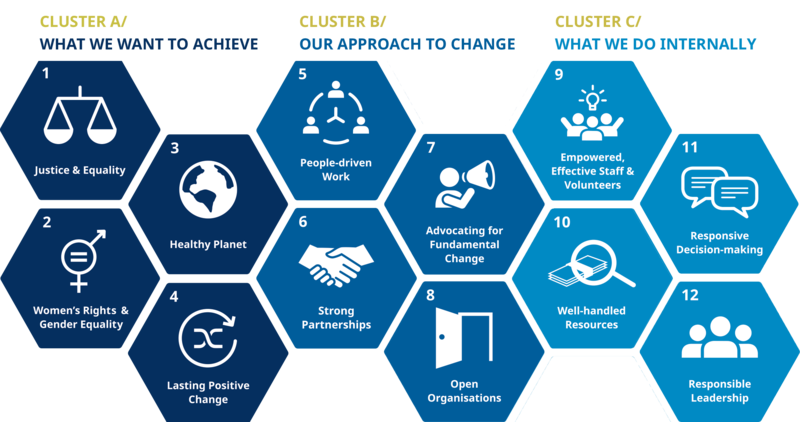 They are organised into three clusters: what CSOs aim to achieve, how to approach change, and how to shift internal practices. To support organisations in adopting the Global Standard and its 12 Commitments, we have developed Guidance Materials and other resources that you can download and read to kick-start discussions in your organisation on how to align with the Global Standard.